I've never bought a whole pineapple before in my life. There. I said it. Yes, I realize that most other adults have already ventured into the world of pineapples which aren't frozen or canned in sugary syrup. Why have I waited so long? Who knows. Perhaps the thought of dissecting one always seemed too daunting. Perhaps I never thought I could make use of an entire pineapple before it went bad. Perhaps they just looked too prickly to mess with. Well, regardless of the reason, I never did....that is....until today! The original impetus for this new adventure was that I wanted to make another one of my AMAZINGLY DELICIOUS "Pina Colada Green Smoothies" (recipe below). The last time I made it, I used frozen chunks. 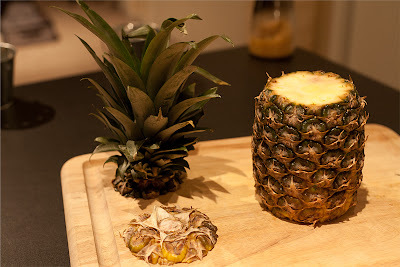 This time, however, I wanted to try a whole pineapple because they are in season right now....which means they should be juicy, sweet, and spectacular! Before I left for the grocery store, I did a little research. 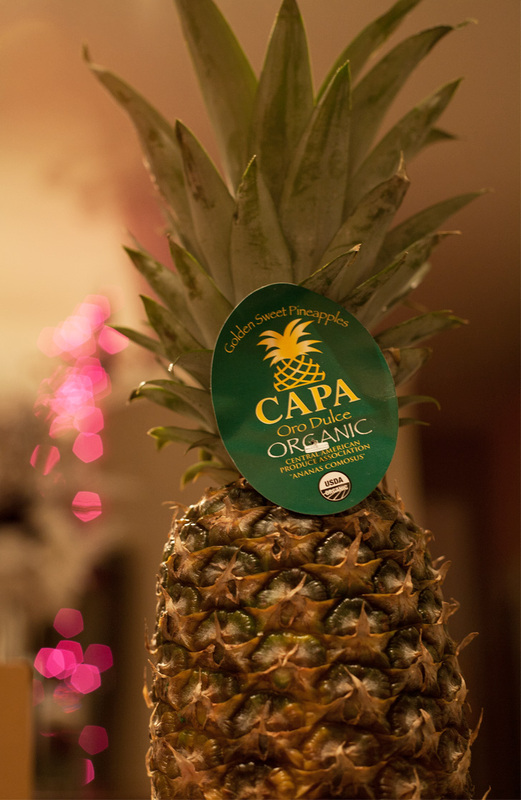 Turns out, you can't detect a pineapple's ripeness based on color or any other external factors. So, uh, what now?!? Well, here's where you have to hope that you are shopping at a reputable store. 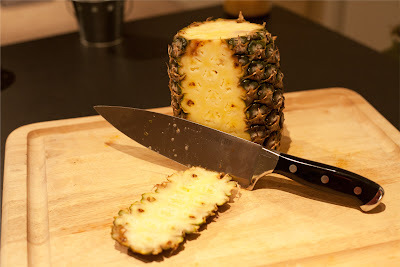 If so, the store will only stock pineapples which were picked at the peak of ripeness (as pineapples stop ripening as soon as they're picked) What you do need to focus on is the general "health" of the pineapple: does it look fresh (not dry), is the base shell firm, are the leaves sturdy? If so, you should be good to go. And, of course, it should be organic! Now that you've selected your pineapple and gotten it home, it's time to cut. 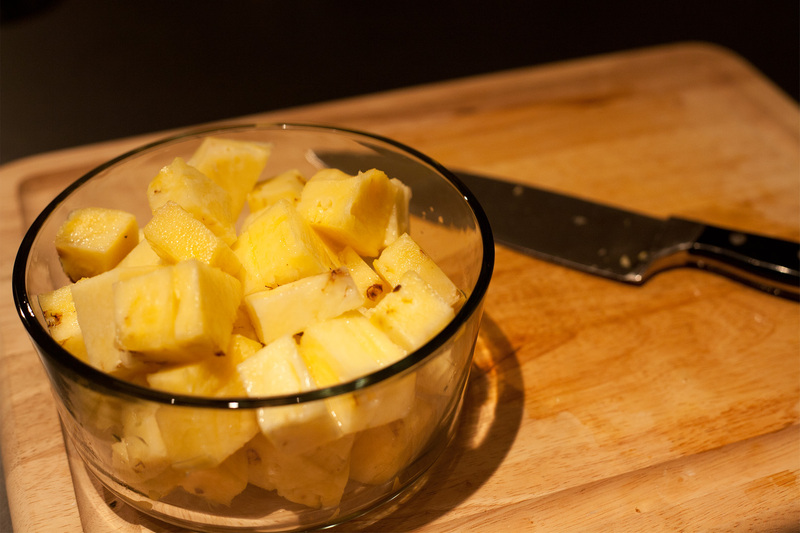 1) Using a large, sharpened knife - cut off the top & the bottom of the pineapple. 2) Now, cut vertically down the side of the pineapple - following the slight curve of the shell. 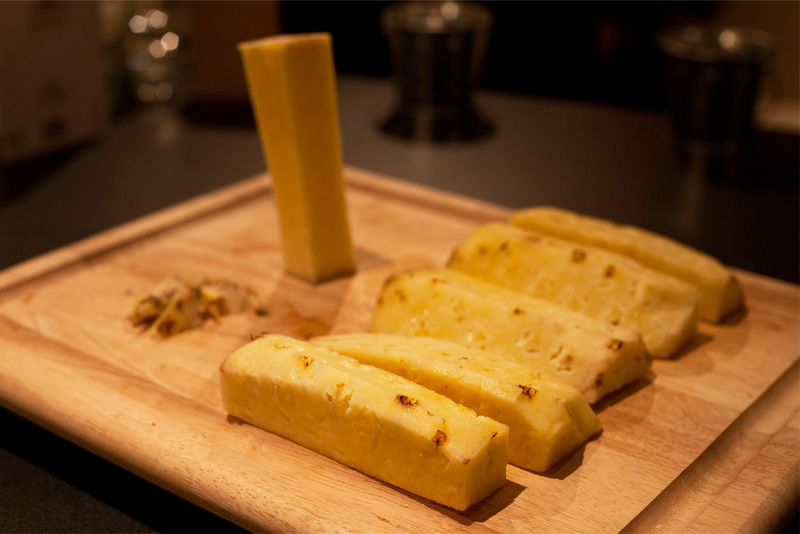 3) Depending on the size of the pineapple and the size of your knife, the number of cuts necessary will vary. For me, I was able to make 6 even cuts - resulting in a perfect hexagon. 4) Once the shell has been cut off, there may still be a few small bits left on the fruit. If so, just take a small paring knife or a potato peeler and carefully cut them off. At this point, you will need to decide if you want *slices* or *chunks*. If you want slices, just turn the fruit onto its long side and slice to the thickness you desire. 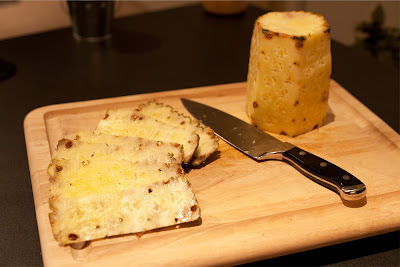 Once sliced, you will need to take a small paring knife and carefully cut out the core from each slice (about the size of a quarter). I, however, wanted *chunks*....which is MUCH easier!!! Yay. 5) If you want chunks, just cut vertically down the sides of the fruit (in the same way you cut off the shell). The core is pretty easy to spot. You should be able to make 4 or 5 cuts around the core, leaving it fully intact. 6) Now you're home free! Just cut into whatever size chunks you desire. Before you throw them in a smoothie or a recipe or the refrigerator....be sure to have a piece....to sample the fruits of your labor (figuratively AND literally). So yummy. Mmmmmm. And finally, my "Pina Colada Green Smoothie" recipe! If you have a high-powered blender (e.g. Vitamix), just throw everything in and blend away. Otherwise, dice the carrot and tear the greens into smaller pieces. Blend until all ingredients have fully combined (2-3 minutes). Divide into 2 containers (16oz mason jars work great). You can freeze the smoothies and thaw them overnight in the refrigerator.